Across West Virginia, high schools offer career and technical education to give students a leg up in their fields before graduating. These programs can include skilled trades like welding, shop classes, or even meat processing. 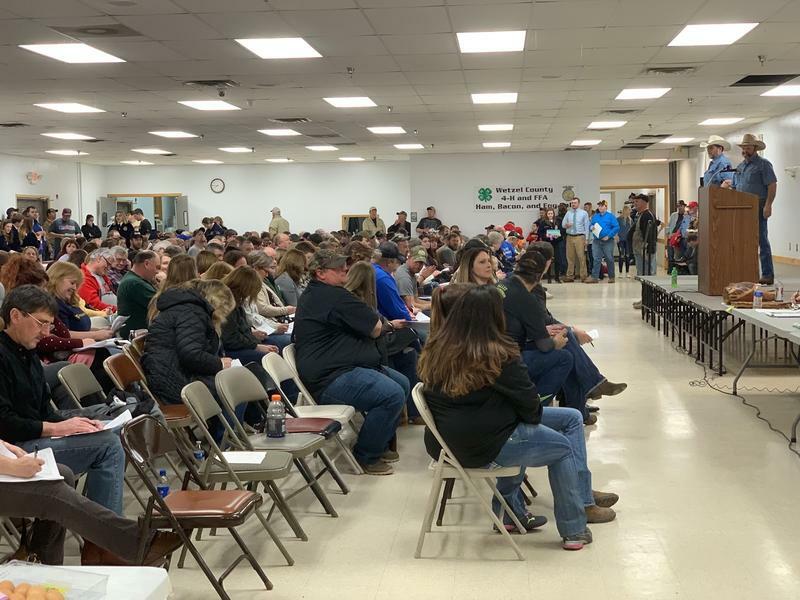 Tucked away in a New Martinsville 4-H Camp, two auctioneers stand on a small indoor stage, denim-clad and wearing cowboy hats, securing bids on something a little unusual… ham, bacon, and eggs. It’s a culminating event for high school students in Wetzel County who have overseen the entire ensuing meat and poultry process. Magnolia High School agriculture instructor Scott Ash explained that twenty kids are in the program. The auction is part of Wetzel County’s career and technical education (CTE) program, which like many similar programs throughout the state, gives students a chance to learn hands-on career skills while still in high school. One of these students is Bailey Fayad, who said she loves the life lessons this program has taught her. “It’s honestly a great thing to get involved in because it shows you a lot of responsibility outside of school, and the environment and stuff like that. It is definitely a great impact on kids that they need to do,” Fayad explained. 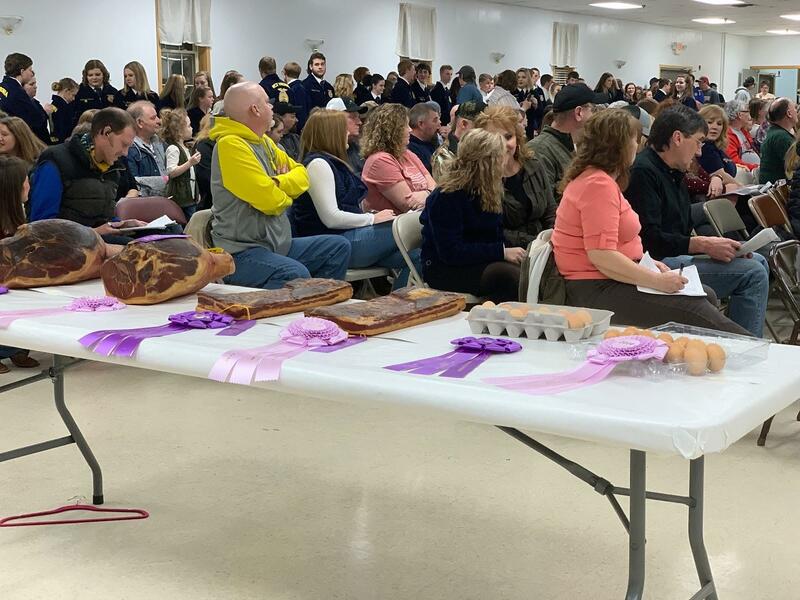 Along with students from Magnolia, Hundred, and Pine Grove high schools, Fayad entered her ham and bacon to the Wetzel County 4-H and FFA Ham Bacon and Egg Sale. This event has become an institution in the county. In its 51st year, the auction attracts prominent buyers including law offices, banks, and other prominent businesses from the community. The products can go for quite a bit of money, too. Ash mentioned it wasn’t unusual to see hams go for around $25 a pound. All proceeds are passed back to the students, who invested the time and their own money into the product. Fayad received the top prize for bacon in the county this year. This is her second time doing so, which earned her a new nickname, Bacon Queen. Last year, when she was a grand champion, the Bacon Queen’s meat went for about $2,000, but prices vary a lot depending on attending buyers on any given year. This year she made even more money. Fayad’s bacon weighed 6.7 pounds, fetching a final price of about $3,400 — a new record for the auction. As the night went on over a hundred items were auctioned off, the ham and bacon were auctioned by pound and the eggs were sold by the dozen. Each of the highest bidders has the option to keep their prize, donate it to the fire department’s yearly dinner, or donate it to be sold again in a fundraising event for Future Farmers of America and 4-H scholarships. All told, the auction can bring in as much as $75,000 for students. After the county auction, students prepare for the state auction in Charleston where they will join students from all the other counties with similar meat processing, and FFA programs. With a new federal spending bill signed into law, a national emergency over illegal immigration at the country’s southern border declared and the second government shutdown in as many years now in the rearview, it might be tempting to think that the woes of the government furlough are behind us. But for many Appalachian communities the ripple effect can still be felt, particularly among the most vulnerable. The 35-day shutdown lasted from December 22, 2018, through January 25 of this year, costing the federal government over $6 billion. For many in rural communities in the mountains, that meant a lot more than closed parks and late tax documents–it meant standstills at work. And for thousands on the federally-funded Supplemental Nutrition Assistance Program (SNAP—the modern iteration of food stamps), a delay in their food stamps meant difficulty putting food on the table. The sudden stoppage put additional stress on already-burdened area food pantries and food banks in some chronically underserved areas, and those effects have left a wake that could last months into the future. 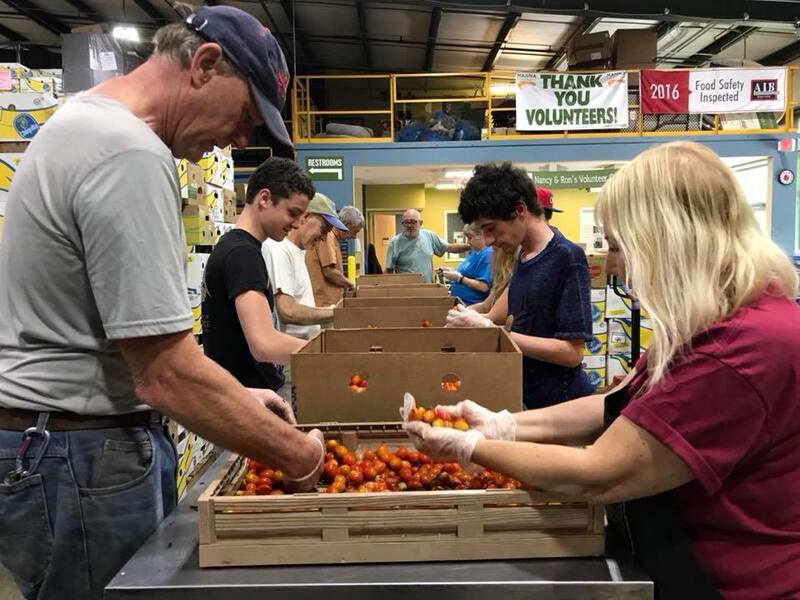 The Mountain Area Nutritional Needs Alliance food bank (MANNA)—the primary food bank in Western North Carolina—scrambled their teams ahead of the shutdown to assess the scope of the situation and figure out who would be most affected. There are seven National Parks in Western North Carolina, and regional headquarters for nine federal agencies in the Asheville area alone, all staffed by federal workers. According to the National Treasury Employees Union, there are 6,216 federal employees in Congressional District 11, which stretches from Hickory all the way to the Tennessee border. For the staff at MANNA, there was a big concern that with every missed paycheck, otherwise secure federal employees and their families could find themselves suddenly struggling. MANNA is a major organization in the region and distributes more than 18 million pounds of food annually. MANNA partners with 220 local agencies in 16 counties throughout the region. At the airport alone, MANNA served 152 people over the course of three different free popup markets, where tables were piled high with a wide variety of fresh foods. But the furloughed government employees weren’t the biggest burden for the food bank and their regional partner pantries. A disruption in the federally-funded SNAP benefit program left many families struggling to keep their cupboards full. Nearly two months later, food pantries across Appalachia are still scrambling to meet increased demand. The U.S. Department of Agriculture directed states to send out February SNAP benefits in mid-January ahead of the shutdown. This forced families to budget almost two-month’s worth of limited benefits that generally stop short of covering monthly food budgets. During the shutdown, SNAP recipients had to stretch those benefits over 42 days, resulting in increased pressure on food banks to feed local families affected by the lapse in assistance. Nesbitt and the rest of MANNA found themselves having to warn their 220 partner pantries to prepare sufficient supplies to account for an increase in need long after the shutdown had ended, through the end of the month. In 2015, a survey by the USDA found North Carolina to be the 8th most food insecure state in the nation. In the 23 counties that make up the western part of the state, 16.9 percent of the population goes without regular access to food, and more than 155,000 people receive food stamps. And SNAP doesn’t fully cover this need, even without interruptions in services. “People that are working poor, or people that are working at that $8 an hour job, their SNAP benefits, even with that small amount of income, can sometimes be as low as $42 per month because they have other income. Is it helpful? Yes, does it meet your needs for your food budget? No,” Nesbitt said. Western North Carolina isn’t the only part of Appalachia still reeling from the shutdown. In New York, the Food Bank of the Southern Tier services 6 counties. With more than 73,000 people already at risk of hunger in the region, the food bank services more than 18,800 people every week, but according to the Evening Tribune, the food bank has seen a 45 percent increase in the pounds of food ordered by their partner pantries. According to the Pittsburgh Post-Gazette, pantries there saw as high as a 166 percent increase in need, citing the delay of food stamps due to the shutdown. The Greater Pittsburgh Community Food Bank covers 11 counties with more than 400 partner pantries that service more than 326,000 food-insecure residents. The Post-Gazette reports that just at their Duquesne headquarters, they have seen a jump of 145 families all citing the deferred SNAP benefits as the reason they need additional help. In the high country of Candler, right on the outskirts of Asheville, still within the limits of Buncombe County, nearly 60 percent of the population lives below the poverty line. Montmorenci United Methodist Church has become a haven for the hungry, hosting weekly dinners every Monday night and a free market on Thursdays, distributing food donated by MANNA. Montmorenci has seen a 20 percent rise this winter in the number of families serviced each week, from 75-80 families to well over 100 regularly attending their food events. ”What we are seeing across the board is an increase in people, for whatever set of circumstances, needing to turn to our pantries in order to get through the week and the month,” Nesbitt said. Just last week, Congress voted to block President Trump’s emergency declaration over immigration, which in-part ended the shutdown in February, setting the stage for another potential showdown that could result in months of partisan gridlock. On top of that, the President’s just-released 2020 budget would slash $17.4 billion from SNAP this year, $220 billion over the next 10 years, leaving organizations like MANNA to pick up the slack. Jonathan Ammons (@jonathanammons) is a writer, eater, drinker, bartender and musician based in Asheville, North Carolina. Rosenthal writes nostalgically about his adventures in wrong turns, when the lack of handy GPS navigation made his attempts to seek out novel wines for the American market in the late ‘70s that much more of an adventure into the unknown. In Giles County, too, there’s a lot of meandering through winding country roads marked only by route numbers. But unlike in European wine country, where vineyards neatly carpet the ground for miles, the Appalachian forests often hide manicured grape vines until sudden openings appear on sloping hillsides. Jessee and Deborah Ring, owners of JBR Vineyards, had their share of meandering and false starts in bringing their winemaking dreams to fruition. Two failed grape crops preceded a 2006 harvest that was deemed successful even though only 40 percent of the vines survived. Despite these challenges, in 2017, the Rings harvested three tons of grapes, which translates to more than 750 bottles. The establishment of vines at JBR Vineyards stands out for reasons beyond an increase in grape and wine production on the property. The Rings are growing “classic” wine grapes, technically known as Vitis vinifera, including Riesling and Pinot Noir, two grape varieties that specifically favor cooler and drier climes. Pinot Noir has a notorious reputation as a finicky and fragile grape and is even more challenging to grow in the asphyxiating humidity of the mid-Atlantic. It needs cool weather to thrive, but when temperatures drop too low, the grape withers on the vine. In a region of Virginia known more for its affiliation with working class spirits like whiskey and moonshine, wine fever has bolstered grape cultivation, with winemakers leading a culture shift that started 40 years ago. Today the Rings and other commonwealth vitners are following in the footsteps of some long-established wineries in southwestern counties. Since 1978, locals and tourists alike have been familiar with Chateau Morrisette, a vineyard in Floyd, Virginia, known for its iconic semi-sweet Our Dog Blue blend of Riesling, as well as its sweet dessert wine, Red Mountain Laurel. Newer wineries have continued to spring up at a steady clip in the region. Abingdon Vineyards began operation in 2001 and closer to Blacksburg, there’s Beliveau Estate which began producing wine in 2011. When the wine industry started gaining traction in the ‘70s as more than a casual passing fancy for retirees, there were six wineries in the commonwealth. That number exploded to 46 in 1995 and to 107 in 2005. Fast forward to the present day and Virginia is home to nearly 300 wineries, the sixth-most in the nation. Many have clustered in central Virginia, where factors such as elevation and climate are generally favorable to vitners. Those wineries also leverage their proximity to the throngs of tourists from metropolitan Washington, D.C., promoting the region’s prestige as home to the Monticello American Viticulture Area. In the southwestern corner of Virginia, Congressman Morgan Griffith (R-VA, 9th District) thinks the popularity of wineries will bolster a region that can support its identity as both a rugged outpost and a place that caters to more diverse tastes. Other sections of the state have reconciled these seemingly contrasting selves in the form of agritourism, an industry that supports 344,000 visitors and $120 million in the Southwest region of the state. Other agritourism businesses in Giles County include Doe Creek Farms, a pick-your-own apple orchard. In addition to providing fresh fruit for its visitors, Doe Creek hosts weddings and offers wine from their family vineyard, located a couple of hours away in the town of Hurt, along the Virginia-North Carolina border. “It’s important to have that ability for people to tour an area [with wineries] and be able to say ‘let’s try that one’ and go and see a winery that’s a little ways down the road,” said Griffith at JBR’s opening earlier this summer. But the fact that the Rings are growing vinifera grapes at all has just as much to do with an environmental and climate shift as it does a culture shift in this part of the state. As temperatures rise and weather patterns become increasingly unstable, erratic weather events associated with a changing climate will prove difficult for managers many agricultural endeavors worldwide, especially wineries. In recent years, Giles County has experienced the same warming trend affecting world-renowned wine regions, including Champagne in northeastern France. The Rings’ 2018 harvest, though one of the most prolific in JBR’s history, started in August for the fifth time in 15 years. That’s early for a harvest that typically begins in early September and was purported to have begun in October 30 years ago. Wolf came on board as Virginia Tech’s viticulture expert in the ‘80s. Many of the stand-out wine varietals of Virginia we know today gained notoriety after Wolf’s research initiatives scientifically determined which grape varieties would work best in the region. Well adapted to the warm, humid climate, Viognier, Virginia’s official state grape, and the hybrid Chambourcin are among many varieties the state is known for today. 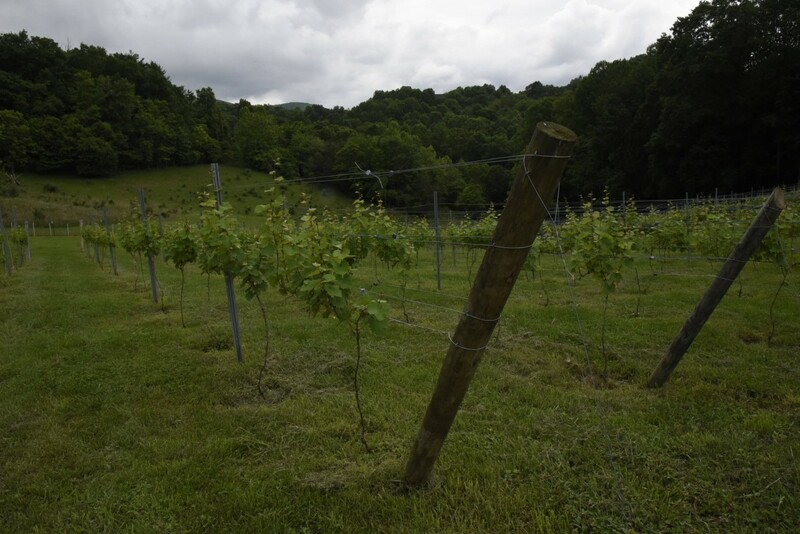 Cultivation of classic grapes is still a rarity in Virginia, especially in Appalachian counties. Of the 5,772 tons of vinifera grown in Virginia in 2017, only 53 of those tons were Pinot Noir. The few tons at JBR Vineyards represented the only Pinot Noir harvest in Giles County. Would it be easier to grow native hybrids of grapes in this part of the world? Sure. But in spite of the difficulty in growing classic wine grapes in Southwestern Virginia, Jessee Ring wouldn’t have it any other way. Like many American winemakers, Ring is smitten with the mythology of European grape varieties and the wines they produce. He’s transfixed with growing such prestigious varieties in the hills and valleys of Southwest Virginia. And while classic grapes face plenty of challenges in Appalachia, Ring believes there could also be a practical reason for planting varieties such as Pinot Noir. The grape ripens early, so under certain conditions, it could actually be less susceptible to weather-induced conditions such as mold and rot, compared to its later-ripening cousins. If growing wine grapes is a burgeoning enterprise in the tiny triangle point of Southwest Virginia, so is drinking their fermented juice. Such a phenomenon is evident at The Blacksburg Wine Lab, a recently opened establishment that’s part salon, part wine bar, part gathering place. Boyer is a Virginia Tech geography instructor, renowned for dismantling the pretense of wine and making it accessible to the larger public through his Geography of Wine class. Though class enrollment started out small in number 18 years ago, it was most recently offered to 1,300 online students. Boyer’s class was born out of his own appreciation for viticulture. In the early ‘90s, as a geography student, he analyzed the grape growing potential of land parcels across Virginia, which was still just waking up to its potential as a wine-producing state. Boyer became enamored with the idea of a potentially heavy hitting wine industry in the commonwealth, capable of making wines that express terroir in the same way its national and international counterparts do. A mere 20 years and 250 wineries later, Virginia is far from a sleepy outpost of wine production. Pritchard, who is in charge of food and wine pairing at the Wine Lab, is a former student of Boyer’s and enjoys the idea of exploring wine regions in a glass, whether those locales are down the road or across the ocean. “You can go to a wine bar and travel the world through wine,” said Pritchard who opted to showcase Sicilian wine and victuals for the lab’s inaugural tasting event. If wine can be a gateway to understanding terroir and culture, the characteristics of a region as they are rendered in the subtle aromas and tastes inside a glass, it raises the question: Will a grape cultivated in southwestern Virginia ever pass muster against its European cousins, exhibiting the region’s mountainous limestone, gently rolling hillsides and humid summers? Pritchard thinks it’s possible. “Fifty years from now they might find the perfect grape that grows really well in a microclimate of Giles,” she said. But will that grape be Pinot Noir, like those grown at JBR Vineyards? The answer to that might be that it’s just a matter of time. Is Food the Key to This Small Pennsylvania Town’s Economic Revival? Lincoln Avenue slices Bellevue down its belly, the only break in the borough’s neat rows of Queen Annes, Colonial Revivals and Craftsmans. The town climbs a hillside along the Ohio River, just six miles north of Pittsburgh. During a 90-year stretch, beginning with the streetcar boom of the 1890s and ending with the decline of steel in the 1980s, the avenue offered residents every shop and service they could ever need in a tightly packed, half-mile stretch. Markets and movie theaters. Bakeries and dress boutiques. Isaly’s and ice cream. But by 2013, when Judy McAuley opened the Happy Baby Company, a children’s boutique, in the avenue’s 500 block, the Bellevue boom had long ago busted. The stately single family homes had been chopped into apartments, and Lincoln Avenue’s quaint shopping district had been overrun by pizza shops, dentist offices and insurance companies. Like many Ohio River towns, Bellevue’s economic decline resulted in higher taxes and a dwindling population. Its current population of 8,300 is about half of what it was at the peak 60 years ago. Despite the borough’s challenges and the nation’s tough retail climate, McAuley reluctantly renewed the lease on her downtown property last summer. “I’ve been feeling like Bellevue’s been improving, not declining,” McAuley said. And she’s hopeful that two new restaurants, the upscale Revival on Lincoln and the more relaxed Lincoln Avenue Brewery, will serve as the catalysts for revitalization, transforming the dilapidated downtown into a destination. It’s happened in other Pittsburgh neighborhoods, to varying degrees and acclaim, over the past decade. The food-driven renaissance in East Liberty and Lawrenceville led to Zagat naming Pittsburgh the country’s No. 1 food city in 2015. But it also drove home values so high that many residents were priced out. 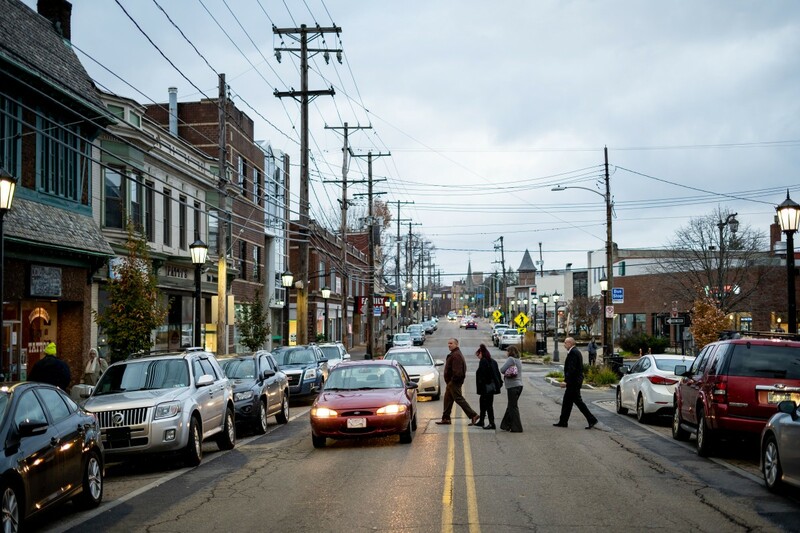 In Braddock on Pittsburgh’s southeast side, the poverty rate still hovers around 30 percent and many residents remain food insecure despite the neighborhood being home to Superior Motors, one of Food & Wine’s 2018 Restaurants of the Year. Bellevue’s location—a quick, 15-minute drive from Pittsburgh—affordability and walkability make it ripe for a resurgence. But right now, the town is still living in the gap between “better than it was” and “not yet all it could be,” leaving residents and business owners like McAuley wondering whether this future built on a foundation of food is a recipe for success or disaster. Amy and Joel Haldeman moved to Bellevue eight years ago, lured by the borough’s pedestrian-friendly layout and downtown business district. They soon found, though they loved their meandering strolls down tree-lined streets, their arrival at the business district was underwhelming. “How do you say dead without saying dead?” Joel Haldeman asked. They decided they wanted to be part of the solution. So they bought a property at the corner of Lincoln and Hawley avenues and partnered with their friends, lifelong Bellevue residents Lisa and Grant Saylor, to launch Lincoln Avenue Brewery, a cozy and slightly industrial hangout for Bellevue’s beer connoisseurs. In a nod to the town’s growing number of homebrewers, the brewery will also offer a program for some of the best locals to scale up their operations and offer their product on tap. It’s slated to open this winter. Bringing a brewery to Bellevue once would have been impossible. The town only lifted its ban on alcohol in 2015, eight decades after the end of prohibition. Grant Saylor, who also sits on borough council and the community development corporation board, was an early advocate for alcohol after watching several Lincoln Avenue restaurants—including Pizzeria Regina Margherita and Vivo—flee the borough for wet towns with better foot traffic. Several blocks north at Revival on Lincoln—a high-end eatery located in a turn-of-the-century, former funeral home—co-owner Chris Driscoll says his restaurant wouldn’t exist if Bellevue hadn’t lifted the ban. Driscoll and co-owner, former chef John King, opened Revival on Lincoln in early November. In a nod to Bellevue’s heyday, and in keeping with the Classical Revival-style of the historic building, they left the floor plan and details virtually untouched. The open foyer, hardwood floors and stained-glass windows are all original, and the building is set to be added to the National Register of Historic Places next year. Patrons have already traveled from outlying Pittsburgh suburbs like Sewickley and the South Hills to get a glimpse of the interior and try Chef Jamie Sola’s take on shrimp & grits and fried bologna & cheese. Driscoll always envisioned Revival as a destination restaurant—there’s only one other high-end restaurant between Sewickley and downtown Pittsburgh after all—so he’s pleased with the diverse clientele, but he also knows his restaurant resides in an economically depressed town. “We made it a point to keep our price point affordable,” Driscoll said. Entrees are priced between $13 and $34; brunch plates go for $11 to $25. That’s lower than Pittsburgh’s top restaurants, but still out of range for many residents who are used to frequenting Lincoln Avenue stalwarts like Joe’s Rusty Nail, where $12 gets you a stuffed chicken breast, mashed potatoes, cranberry sauce, green beans, a house salad and a bread basket. Shortly after taking office in May 2018, Bellevue Mayor Emily Marburger created the Sustainable Growth and Inclusiveness Committee, a group of active community members who are thrilled with Bellevue’s sudden foodie status, but want to ensure responsible growth. Lincoln Avenue Brewery and Revival on Lincoln aren’t the only newcomers to Lincoln Avenue. Grille 565, located across the street from the Happy Baby Company, bought the town’s first liquor license, and 202 Hometown Tacos is scheduled to open near Revival in December. Case in point: The Center of Bellevue ministry center, located across the street from Lincoln Avenue Brewery, offers a free meal to residents every Monday. The last time Marburger attended, hundreds showed up. Another ministry, The Shepherd’s Door, provides a backpack full of free snacks and meals to children every Friday so they don’t go hungry through the weekend. More than 55 percent of students at the Northgate School District, which serves Bellevue and neighboring Avalon, are eligible for free or reduced school lunches. Marburger is also conscious of rising property values. About 60 percent of Bellevue residents are renters, and it’s not unusual to find a decent place for $500 per month. But Marburger worries that could change as restaurants thrive, spurring developers to purchase older apartment buildings, completely renovate them and hike prices. When Amy and Joel Haldeman bought the brewery building, they also inherited five upper-floor apartments. Though their building renovations justified a price increase, they purposefully kept rent stagnant. Marburger has fewer concerns about home ownership. Though housing values have risen about 7 percent in the past year, the prices are surprisingly affordable considering Bellevue’s walkability and proximity to Pittsburgh. The median home price is still an affordable $135,000, compared to $171,000 in Pennsylvania, leaving room for growth without inciting a housing crisis. “No one’s aiming to be Lawrenceville,” Driscoll said, alluding to the Pittsburgh suburb’s skyrocketing real estate prices, driven, largely, by the influx of top-tier restaurants. Lincoln Avenue Brewery’s Lisa Saylor has the same aspirations.